There I was, minding my own business with a party of eight from our diocese, being a humble Kirchentager, when who should come waltzing up to me but my friend and colleague Bishop Nick Baines, all round esteemed colleague and Meissen Commission wonk? Unlike me, Nick actually speaks proper German. I’m very much looking forward to his contribution. I’m not underestimating any of us here when I say that Church of England participation in what is, overwhelmingly, the largest and most significant Christian gathering in Europe, if not the world (125,000 people here this year) is light, to say the least. The only frustration so far has been the failure of the organisers to connect up to the fast Wi-Fi system at the Messe, forcing humble (and penurious) souls to hang around the station typing furiously into space, to the general mystifaction of assorted travellers, drunks and evangelists... It's a great life. People talk about Kirchentag moments, and this morning contained one or two very significant ones. I have no time to say how joyful it was to be only feet away from the head of Government of the largest nation in Western Europe, as she provided Ronettes style backing for a renidition of Swing Low Sweet Chariot. Anyway, that would be telling. 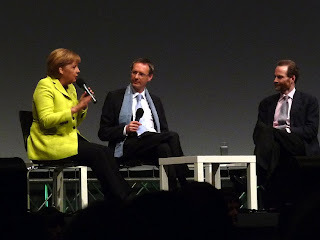 But I was greatly impressed with Angela Merkel’s session this morning. She talked modestly and realistically of life in the East for 35 years before the wall came down, and of the challenges involved in maintaining a free society — Freedom, Order, and Responsibility. She explored what freedom and democracy mean, and how it is possible to maintain some sense of momentum in a complex and diverse liberal democracy. Then, right on cue, came a demonstration by local farmers. She engaged calmly, and gently reiterated the value of dissent, and the primary importance of everyone being able to express themselves in a way that had not been possible in the old DDR. However, she warned, there is a danger of creating a society where everyone has something angry to say, but nobody’s listening on anyone else. The answer is to feed the roots of civil society so that people can get together to refine and press their various points of view in ways that test them and engage with others who differ, rather than just sloganising resgardless, with everyone shouting past each other. And for the first time in a very long time I realised I was near a politician who was enacting, only feet away, exactly principles of tolerance she had been commending in theory minutes before! Alignment! Gott sei Dank! 'dank' should have a capital D - 'Dank'! Merkel is head of government, not head of state though. Many thanks — corrections noted and implemented — including the one that proves my point about +Nick’s German!